As the LG LU2300 started to appear early last week, it soon became apparent that it would be a high-end offering out of LG's camp – something that could ride on the heels of other recent top of the line Android models. 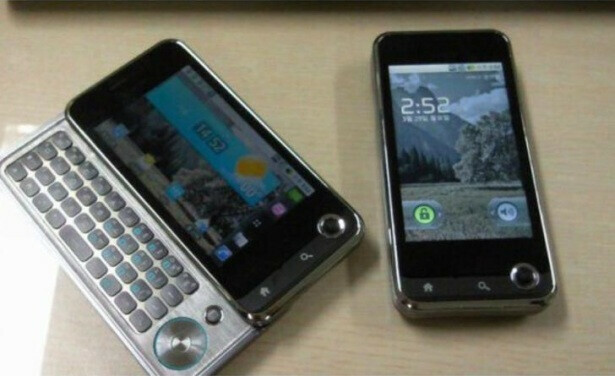 Now we find that it is the big brother of the LG GW620 InTouch Max and that its specs are now made known – it features a 3.5” AMOLED touchscreen, Android 2.1, 1GHz Snapdragon processor, DivX support, 4 line landscape slide QWERTY keyboard, 5-megapixel camera, Wi-Fi, and a DMB Tuner. In addition, there will be a focus surrounding augment reality as it'll be packing a few AR apps from the start. US consumers will have to wait for a while before they get a taste of any high-end Android offerings from LG as the LU2300 is expected to be released for the Korean market either this month or May. This will undoubtedly be only the beginning for LG as they continue to hopefully place an aggressive stance on their Android development. wow, the aluminum-ish (not sure if it is really aluminum) keyboard looks very nice. The locked screen looks pretty cool without the "popular" slide and unlock. The button on the bottom right (big circle) looks stylish to me. However, I have this thing that I sometimes neglect to get Korean products >< This phone needs cute colors for girls, really~! Cool looking phone. Also like that it has support for DivX. Are there any video players on Android that support DivX right now?